Lo! We have heard of the glory of the kings of the people of the Spear-Danes in days of yore – how those princes did valorous deeds! 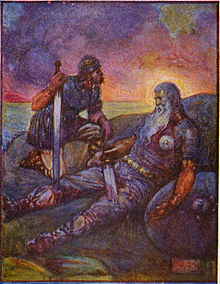 Beowulf is the only surviving complete epic poem written in Anglo-Saxon. It may date from the 8th century, though this is highly contentious. Unless otherwise noted, the translation used here is that of John R Clark Hall, as amended by C L Wrenn (1950). 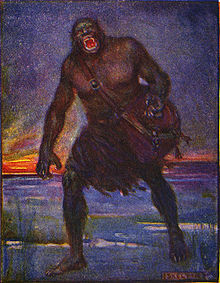 Thence all evil broods were born, ogres and devils and evil spirits — the giants also, who long time fought with God, for which he gave them their reward. Incline not to arrogance, famous warrior! Now shall the fullness of thy strength last for a while. Each of us must expect an end of living in this world; let him who may win glory before death: for that is best at last for the departed warrior. Baleful death has banished hence many of the human race. in mǣgða gehwǣre man geþēon. on flōdes æht feor gewītan. hæleð under heofenum, hwā þæm hlæste onfēng. They laid then the beloved chieftain, giver of rings, on the ship's bosom, glorious by the mast. There were brought many treasures, ornaments from far-off lands. Never have I heard that a vessel was more fairly fitted-out with war-weapons and battle-raiment, swords and coats of mail. On his bosom lay a host of treasures, which were to travel far with him into the power of the flood. They furnished him with no lesser gifts, and royal treasures, than those had done who, in the beginning, sent him forth over the sea alone, child as he was. They set besides a golden standard high above his head, and let the sea bear him, — gave him to the ocean. Their soul was sad, their spirit sorrowful. Counsellors in hall, mighty men beneath the heavens cannot say truly who received that load. Line 34, Scyld Scefing's body is committed to the sea. metod for þy māne man-cynne fram. On Cain's kindred did the everlasting Lord avenge the murder, for that he had slain Abel; he had no joy of that feud, but the Creator drove him far from mankind for that misdeed. Thence all evil broods were born, ogres and devils and evil spirits — the giants also, who long time fought with God, for which he gave them their reward. þæt þec, dryht-guma, dēað oferswyðeð. Incline not to arrogance, famous warrior! Now shall the fullness of thy strength last for a while. But soon after it shall be, that malady or sword shall cut thee off from power, or the embrace of fire or welling of a flood, or onset with the knife, or arrow's flight, or hideous old age. Or brightness of eyes shall diminish and grow dim, and at length it shall be that death shall overpower thee, noble chieftain! drync-fæt dēore: duguð ellor scōc. Now do thou, O Earth, hold fast what heroes might not, — the possessions of nobles. Lo! Brave men won it at first from thee; death in war, horrid carnage, took away every one of my tribe who yielded up this life; they saw [the last of] festive joy. I have no one to bear the sword, or to burnish the plated flagon, the precious drinking-cup; the noble warriors have departed to another place. Now will the hard helmet, bedight with gold, be deprived of its adornments; they sleep who should burnish the battle-masks. The armour too, which stood the stroke of swords in battle, mid the crash of shields, perishes as does the fighter; nor may the ringed mail fare far and wide with the warrior, side by side with mighty men. There is no joy of harp, no pastime with the gladdening lute; no good hawk sweeps through the hall, nor does the swift steed paw the courtyard. Baleful death has banished hence many of the human race. eald and in‐frōd, ǣnige gefremman. gloat where he hangs; he can be of no help. The wisdom of age is worthless to him. the steadings and the fields. lēoda þearfe; ne mæg ic hēr leng wesan. ofer flōda genipu feorran drīfað." I utter in words my thanks to the Ruler of all, the King of Glory, the everlasting Lord, for the treasures which I here gaze upon, in that I have been allowed to win such things for my people before my day of death! Now that I have given my old life in barter for the hoard of treasure, do ye henceforth supply the people's needs, — I may stay here no longer. Bid the war-veterans raise a splendid barrow after the funeral fire, on a projection by the sea, which shall tower high on Hronesness as a memorial for my people, so that seafarers who urge their tall ships from afar over the spray of ocean shall thereafter call it Beowulf's barrow. Beowulf is in fact so interesting as poetry, in places poetry so powerful, that this quite overshadows the historical content, and is largely independent even of the most important facts...that research has discovered. At the beginning, and during its process, and most of all at the end, we look down as if from a visionary height upon the house of man in the valley of the world. A light starts...and there is a sound of music; but the outer darkness and its hostile offspring lie ever in wait for the torches to fail and the voices to cease. This page was last edited on 20 February 2018, at 07:06.